When I bought the dollhouse two summers ago, all the paperwork stated it was built in 1950. I love older homes with character, and mine certainly has a personality all its own. Around the summer of 1950, the original owners of this wee house (I’m only the third) planted two spruce trees on the lawn, one on either side of the front walk. Now, the twin trees truly tower over the dollhouse. Both have stayed healthy until this point, and I’m grateful for that. Funny to think how long the old girl has been here. I’ve been urged by some to cut them down before they fall through my livingroom and kill us all; I spoke to a forestry guy about that, and apparently both trees are thriving and should live at least another thirty years. I hate to chop down healthy trees, particularly when the mature trees are one of my favourite features of this neighbourhood. There are no roots in my sewer lines–and the city comes to foam the pipes every two years to keep the roots from invading my plumbing–so the trees are truly no concern where health, safety, or my bank account are concerned. My twin trees keep the house cooler in the summer because they shade the front of the house, where my bedroom is. I appreciate the better sleep my rather overgrown landscaping provides. I’m also glad the greenery gives me better privacy in the living room. It’s rather like living in the middle of a forest, one the mail woman braves daily to bring me my bills. There’s just one problem. Unlike deciduous trees that only shed their leaves in the fall, my spruces constantly shower the front lawn with needles, sap and seed cones. My steps are constantly sticky with sap, and I can’t go out front in bare feet without picking up all kinds of sticky, icky things on the bottoms of my paws. My yard is like the forests described in old-timey fairy tales, where the clearings are described as blanketed in pine needles. 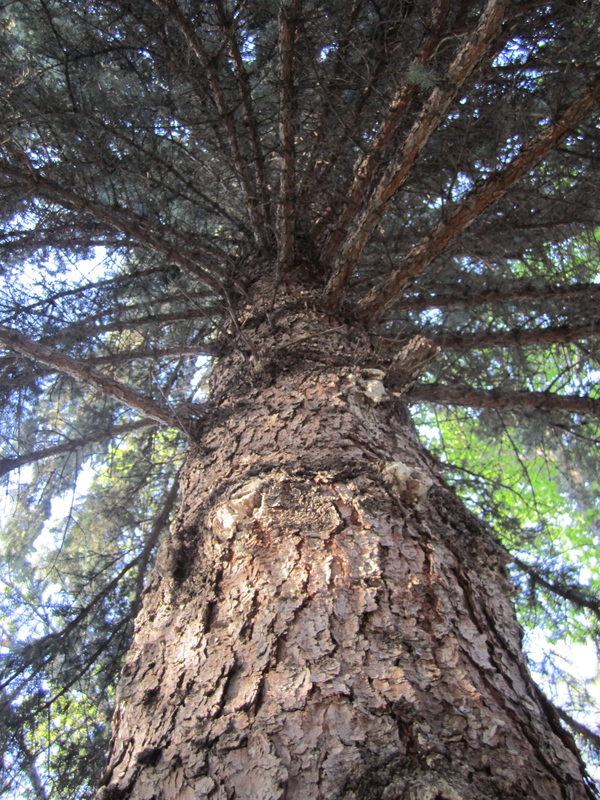 Let me tell you, conifers do not create a blanket that offers any kind of comfort. Because of all the needles, nothing grows in my front yard except the spruce trees. It saves on mowing, but I do long for a little bed of pink geraniums. To make matters worse, and to make me look like a neglectful home owner, my trees have also been bombing my yard with spruce cones. They seem like that neighbourhood cat that’s constantly in heat, desperately attempting procreation every chance she gets. Last weekend, I started raking my front yard. I ran out of time and I ran out of gumption, so The Electrician and I pledged to finish the job this weekend. We hoped a little polish out front could make my house look more kept-up, and it really didn’t seem like a big task for two young, healthy people. Oh boy, were we wrong. The Electrician started working in the front yard while I picked up dog turds and dug some dandelions on the back. The idea was for him to prep the front yard for the mower while I dealt with things behind the house. After I dug as many weeds as my hands could handle, I went out front to give my man some help. I shoveled up a couple piles of spruce sheddings, piling the cones and needles into a garbage can until the bag was full. When I needed to swap bags, he put down the rake and helped me. Before long, because my hands are pooched, I had to trade with The Electrician and pick up the rake. Honestly, I lasted about 20 minutes on the front lawn. I struggled with shoveling, and raking was no better. Within moments, my paws were locking up and my wrists were burning. I tried to keep plugging away, but my sweetie noticed I really couldn’t manage, so he sent me inside to do interior tasks. Considering how allergic I am to conifers, and how much being amid the spruce made my chest ache and my eyes run, I appreciated being moved to another worksite. Partway through his painful labours, I did take him out a mug of ice water, and otherwise he kept working to beat the band. I love that man. Ninety minutes later, The Electrician finished clearing the yard. Then he hauled the bags of botanical rubble out back to the garbage cans. The fruits of all that raking and shoveling. Sorry, Mr. Garbage Man. All told, we (mostly he) gathered and hauled away twenty one bags of spruce needles and cones. Did you read that right? 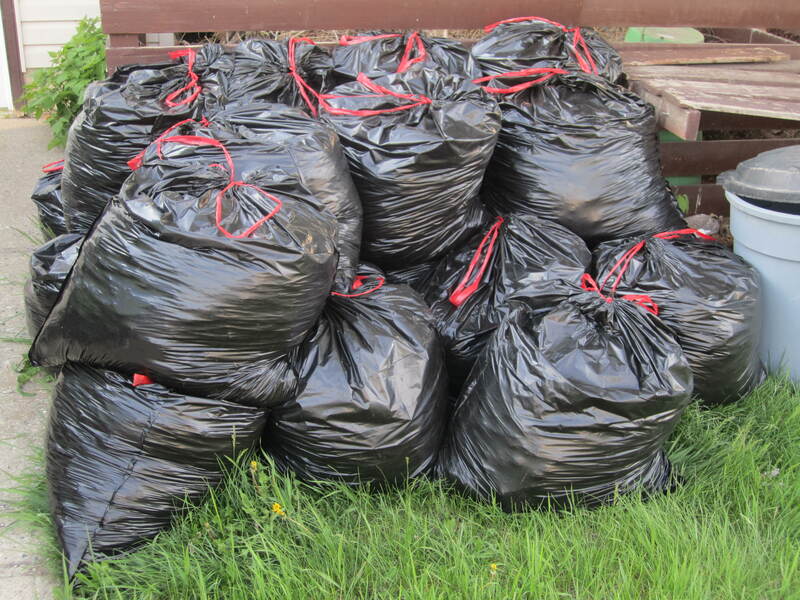 I’ll write it again so you don’t have to backtrack: the man raked and shoveled twenty one bags of crap that fell from my spruce trees. To make matters more painful, these were not just any bags: these were the jumbo, extra-strong version from Costco. I’m astounded that my trees produced so much garbage in the just shy of two years I’ve owned the place. To add insult to injury, there are a couple dozen new spruce cones scattered across the front yard today. I think my trees are mocking us. Previous Post Would You Trade? Seriously?!!!! Twenty-one!! Are you sure you love those trees that much?